Lauren Garnett from Canada succeeded in this year’s DAAD-RISE program for a scholarship at H-BRS in Rheinbach. As a Canadian third year undergraduate student she is currently working with her mentor Patrick Babczyk in the group of Edda Tobiasch within the field of stem cell research. The DAAD Research Internships in Science and Engineering program (RISE) offers unique opportunities for bachelor students to work with PhD students in Germany who serve as their mentors in a period of 3 months. 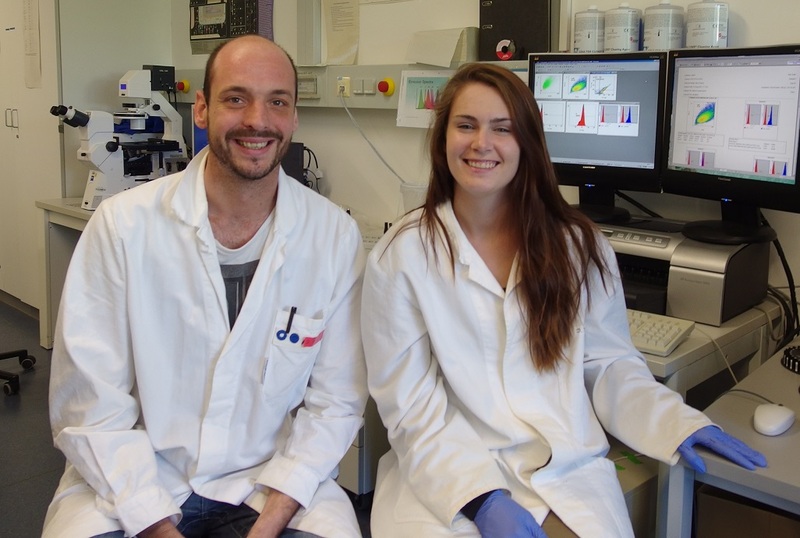 This year the Lab of Molecular Genetics and Stem Cell Biology at the department of Natural Sciences on the Rheinbach campus was again successful in acquiring an intern via the RISE program. The group of Prof. Dr. Edda Tobiasch had received more than 25 applications from undergraduate students. They were from some excellent universities from the USA, Canada and the UK. After a tight selection Lauren Garnett was selected to be the RISE scholar this year. During this summer, Lauren is working with Patrick Babczyk on the project entitled “Creating a Blood Vessel Model to Study Atherosclerosis by Using Human Mesenchymal Stem Cells”. Lauren is a third year undergraduate student at Trent University in Peterborough (Ontario, Canada) studying an Honours Bachelor of Science specializing in Forensic and Health Science. Having no prior practical experience with MSCs, she will learn how to isolate, differentiate, and characterize them during her stay. She will also learn new techniques to isolate primary cells and their molecular biological investigation. About her reasons for visiting Germany, Lauren said: “I love to travel, meet new people and partake in new challenges. So far I have had an amazing time experiencing Germany through hiking, visiting beautiful museums, castles, and getting together to celebrate the Euro Cup Soccer. I also appreciate the opportunity to learn new skills in the laboratory under the guidance of my mentor. The topic of study is intriguing to me as cell culture is something I have never done but have a strong interest in. I look forward to learning more about stem cells and cell culture before returning to my final year of undergraduate studies in Canada. During her stay, she will visit Heidelberg and she intends to travel to the Netherlands and France. Enjoy your stay, Lauren!